Need to download something in a pinch? Peer-to-peer networking is probably the answer, but how do you download files through BitTorrent on Android? Several apps are available. Here’s how to use the best option available and download and share your files on BitTorrent. You might wonder why we’re seemingly promoting illegal downloads by discussing a topic like this. But we aren’t; in fact, BitTorrent isn’t illegal. It’s a peer-to-peer (P2P) networking system that makes downloading and sharing data easy. Instead of everyone downloading a single file from a server, P2P networking lets the people who have downloaded the file then share it with others who want the file. And yes, there are illegal applications for BitTorrent. Almost all torrent sites serve copyrighted data. But the illegality comes in downloading data you haven’t paid the owner for. The actual BitTorrent P2P technology is legal, and used more widely than you might expect. For instance, you might want to download a new ROM for your Android device. There might be a Linux operating system you need to downloaded, or a video game update. Or you might be using Resilio Sync to sync data between your Android phone or tablet and another device. What Is The Best Free BitTorrent Client For Android? Looking for a good torrent client for Android? Look no further. , but we would suggest you stick with the official BitTorrent app. Once installed, you’ll need to give permission to the app so it can access photos, media and files. Browsing the app, you’ll find a screen for torrent files, as well as views for audio and video files. At this stage, the torrent view will be empty, while the audio and video views will list corresponding media on your device. Finding a torrent file to download shouldn’t be too difficult, as several legitimate torrent sites exist on the web. For example, the Internet Archive offers legal torrents of media in its archive. To demonstrate downloading a torrent file on Android, I’m using the example of a Linux distribution, specifically a version of Ubuntu called Lubuntu. This lightweight OS offers a standard download, as well as options for torrent and magnet links (magnet files are essentially a simplified version of torrent files). 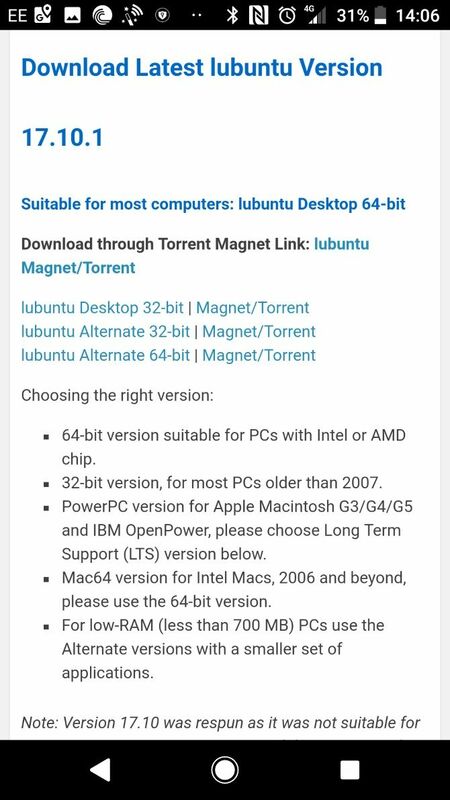 By visiting Lubuntu’s download page, I found the link to the 64-bit version of the ISO file for Lubuntu. However, I had to confirm a few points before I proceeded to download. Does Your Android Device Have Enough Space? Before downloading any data to an Android phone or tablet, you should ensure you have enough storage space. If it’s just a few songs, it’s no problem. But if you’re downloading desktop apps, games, videos, or operating systems, you’re going to run out of space sooner or later. microSD cards are a great way of adding storage to your Android device — but you need to know these tricks! In short, don’t download until you’re certain your device has enough space. It’s also important to ensure your battery isn’t low; BitTorrent will let you know if the device needs to go on charge. Aside from space, your Android device also needs an antivirus, Wi-Fi connection, and a VPN to torrent optimally. or tablet. Wait until the file has downloaded before scanning. If it detects any problems, delete the download immediately. It’s simply not worth letting malware infect your phone. Mobile data these days isn’t as generous as it used to be. As such, if you’re torrenting larger files, it’s a good idea to do this on unmetered wireless internet. After all, you wouldn’t want your data allowance to run out! Switch to Wi-Fi before downloading data. On a similar note, it’s a good idea to use a VPN for downloading torrent files. Many VPNs support this functionality, and it’s a useful option that can help to prevent privacy issues. Need a VPN for your Android device? Here are the best Android VPNs and how to get started with them. Ready to download your BitTorrent file? Upon tapping the link, the BitTorrent app will immediately open, and the data begins to download. You have two views: the Files tab, which lists any torrents currently on the device (uploading, downloading, or otherwise), and Details tab. Here, you’ll see time to download (ETA) and the Speed, as well as the number of Peers (people you’re sharing with) and the number of Seeds (people you’re sharing from). The Download Location is also listed. You can use this option to change the destination of your downloaded files. Obviously, how long this takes will depend upon the data you chose. It’s worth keeping your Android device on a charger for larger downloads. Once the data has downloaded, you’re free to use it in whatever way you can. Note that if you pause sharing, peers won’t receive the data you’ve downloaded, potentially slowing their download speed. As sharing is part of the ethos of torrenting, it is courteous to wait until the amount of data you’ve uploaded at least matches what you’ve downloaded. You can, of course, use media files right away. You can unpack zipped data with the right tools, but if you’re taking risks and downloading from illegal torrent sites, make sure to run a scan with your antivirus tool first. In some cases, you might want to share the data with another device. Cloud storage is the best option here, although you could easily copy the download to a PC via a USB cable. This beginner’s guide is a great introduction to peer-to-peer file sharing with BitTorrent. Get started with torrent downloading in a safe and responsible way with our tips here.